I've had this sample of the Eclipse Age Defence SPF 15 Daily Face and Neck Mineral Balm (name really isn't long enough) for a while now and I decided it was time to give it a go. Disclaimer: I have completely disregarded the SPF in this product and it means nothing to me. If you want to know why you can read this. I know some people love SPF added to their products and that's fine, you're allowed to love it. I just prefer an SPF product who's sole job is being an SPF product. I do mention some thoughts and comments on the SPF properties of this product but I didn't actively try to use it for sun protection. First time I used it I just smoothed it over my face, it goes on really nicely and is easy to move around so you get an even coverage.. I gotta say I really like this, I find it really annoying when a base product is so thick that you are tugging it around your face and I always feel like I'm assaulting my skin. While this stuff is thick it moves really nicely over the skin. Sadly, the product on it's own didn't do a whole lot to be honest. You (I?) don't see the tint what-so-ever so it has zero coverage, it didn't really hydrate or make my skin look any nicer, all I noticed was that my skin felt soft and smooth but since people aren't touching my face very often these days I tend not to get majorly excited about that. I was expecting it to work like a tinted moisturiser but it was just.. nothing. I had a feeling that I wasn't using it as intended..
A unique 2-in-1 anti-ageing balm that’s infused with high performance Mineral Sunscreens (not chemical) that protect against UVA & UVB rays. Complete protection from environmental exposure while providing continuous anti-ageing benefits. Easy to use, this sensational balm instantly moisturises, brightens, smooths and fills in lines leaving you protected with a glowing, youthful, healthy complexion. So on learning that I did in fact used it incorrectly I applied it again the next day over makeup. My god was this a mistake! Straight away my foundation went patchy and uneven. It looked so wrong in so many ways and I had to have a little giggle while I tried to fix the mess that I'd just made of my face. This would be the method you would have to use if you wanted to get SPF protection out of this product, I do wonder how a face of makeup would hold up after 3-4 applications through the day and would be interested to hear from anyone who has used the product this way. Finally the following day I applied it under my makeup. Bingo! 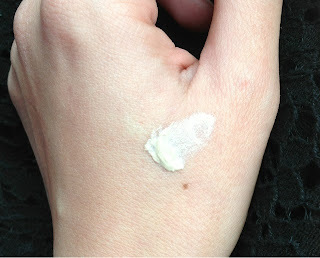 This is where I got the nicest results, I would say it worked like a primer (I think that is what it's actually supposed to be), smoothing out my skin and making it an even canvas. My foundation looked really good over the top and I felt like I was getting better coverage with this as the base, my only gripe was that I looked a little too 'glowy'. Now this isn't really a problem, personally it was a bit much for me but I can see this being an absolute smashing hit for more mature skin or even the younger ladies who feel maybe they are struggling with a dull or dry complexion. Just to be clear, I will still be using what I have left over (happily), I can powder my face to fix up the excess glow and the whole base just comes together so nicely. I like it! Both thumbs up!! It really did give a nice radiant glow, even from under my makeup which really surprised me, it wasn't something I was expecting. Another thing that's quite nice about this product is that it doesn't even remotely smell like sunscreen (I disregard the sunscreen but not the smell! ), I can't smell anything at all when I apply it and even when I do the swatch and sniff test. More thumbs up!! 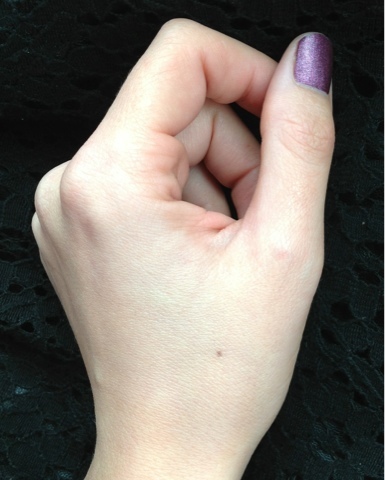 Smoothed in to skin, completely invisible. A few more things I'd like to mention.. It hasn't broken me out which is another huge thumbs up (ran out of thumbs a while ago, I think I'll need to borrow yours for a few moments). My makeup longevity was there with a vengeance and it wasn't slipping in to any of my lines (more thumbs, lets remember I did set with powder so that would have helped but ultimately my makeup did look better than it usually does at the end of the day). Ok so would I buy it? I struggled a little here and then I let my brain do the thinking and not my heart. My usual primer is Benefit Porefessional, it retails at $53.00 for 22 grams of product. 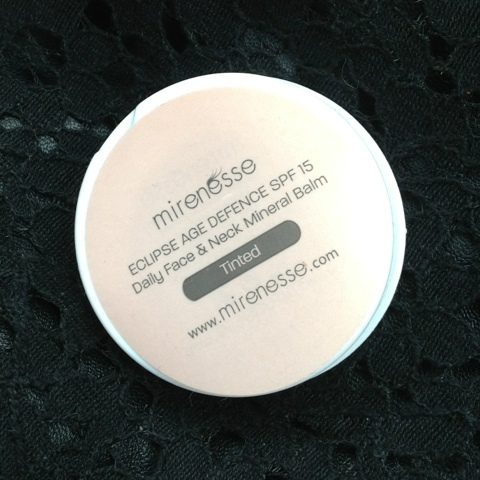 Mirenesse's balm is priced at $69.50 for 18 grams of product (refills only $44.50). 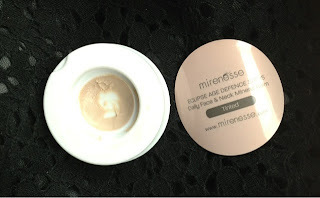 Mirenesse wins on the fact that I feel like I get better coverage out of my foundation and the radiance I see is phenomenal but Benefit takes out the cost prize (but only on a one purchase basis). So ultimately, yes, I would repurchase it but I think I would go for the non tinted because I don't see the point in this being tinted what-so-ever (but I won't get started on that hah!). Have you tried this exceptionally long named product before? Do you think it's a little silly that they didn't just slip the word primer in there for good measure?